Kyle Grillot - kgrillot@shawmedia.com In preparation for Valentines Day, Melanie Zerr of Genoa City, Wis., prepares raspberry creams at Anderson's Candy Shop Tuesday, Feb. 10, 2015 in Richmond. Preparation for the holiday began just before Christmas, preparing boxes of chocolates ranging from 2-ounces to 6-pounds. The fourth-generation candy shop which opened in 1919 in Chicago and then moved to Richmond in 1926, offers at least 80 different varieties of chocolates and will have special hours for the week of Valentines Day. 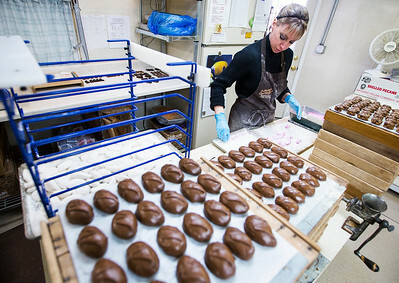 Kyle Grillot - kgrillot@shawmedia.com In preparation for Valentines Day, Britta Malsch of Genoa City, Wis., packages chocolates into heart-shaped boxes at Anderson's Candy Shop Tuesday, Feb. 10, 2015 in Richmond. Preparation for the holiday began just before Christmas, preparing boxes of chocolates ranging from 2-ounces to 6-pounds. The fourth-generation candy shop which opened in 1919 in Chicago and then moved to Richmond in 1926, offers at least 80 different varieties of chocolates and will have special hours for the week of Valentines Day. 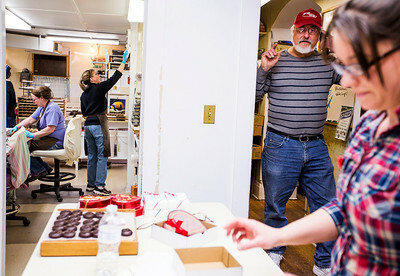 Kyle Grillot - kgrillot@shawmedia.com In preparation for Valentines Day, Colleen Vineyard of Johnsburg, (center left), and Gail Barnum hand dip chocolates at Anderson's Candy Shop Tuesday, Feb. 10, 2015 in Richmond. Preparation for the holiday began just before Christmas, preparing boxes of chocolates ranging from 2-ounces to 6-pounds. The fourth-generation candy shop which opened in 1919 in Chicago and then moved to Richmond in 1926, offers at least 80 different varieties of chocolates and will have special hours for the week of Valentines Day. Kyle Grillot - kgrillot@shawmedia.com Britta Malsch of Genoa City, Wis., packages chocolates into heart-shaped boxes at Anderson's Candy Shop Tuesday, February 10, 2015 in Richmond. Preparation for the holiday began just before Christmas, preparing boxes of Chocolates ranging from 2-ounces to 6-pounds. The fourth generation candy shop which opened in 1919 in Chicago and then moved to Richmond in 1926, offers at least 80 different varieties of chocolates and will have special hours for the week of Valentines Day. Kyle Grillot - kgrillot@shawmedia.com Rows od Snappers sit next to boxes of chocolates at Anderson's Candy Shop Tuesday, Feb. 10, 2015 in Richmond. 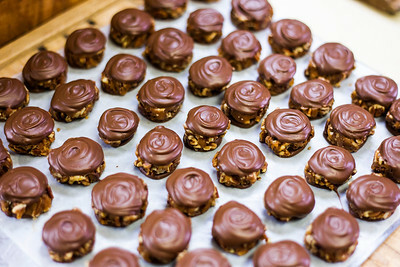 Preparation for the holiday began just before Christmas, preparing boxes of chocolates ranging from 2-ounces to 6-pounds. 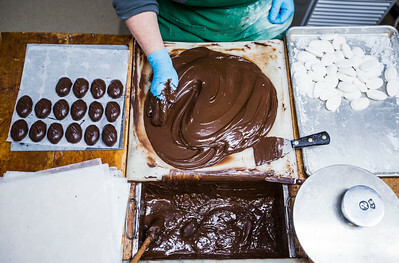 The fourth-generation candy shop which opened in 1919 in Chicago and then moved to Richmond in 1926, offers at least 80 different varieties of chocolates and will have special hours for the week of Valentines Day. 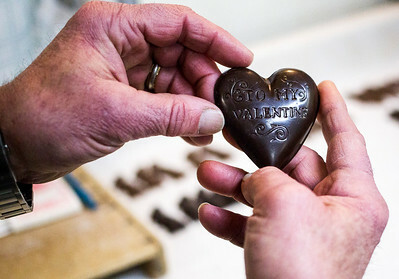 Kyle Grillot - kgrillot@shawmedia.com Owner Leif Anderson hold a molded chocolate for Valentines Day at Anderson's Candy Shop Tuesday, Feb. 10, 2015 in Richmond. Preparation for the holiday began just before Christmas, preparing boxes of chocolates ranging from 2-ounces to 6-pounds. The fourth-generation candy shop which opened in 1919 in Chicago and then moved to Richmond in 1926, offers at least 80 different varieties of chocolates and will have special hours for the week of Valentines Day. Kyle Grillot - kgrillot@shawmedia.com In preparation for Valentines Day, owner Leif Anderson sorts through packages of chocolates at Anderson's Candy Shop Tuesday, Feb. 10, 2015 in Richmond. Preparation for the holiday began just before Christmas, preparing boxes of chocolates ranging from 2-ounces to 6-pounds. The fourth-generation candy shop which opened in 1919 in Chicago and then moved to Richmond in 1926, offers at least 80 different varieties of chocolates and will have special hours for the week of Valentines Day. 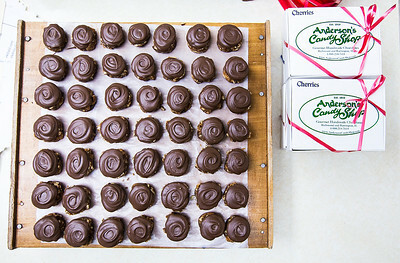 Kyle Grillot - kgrillot@shawmedia.com A Maple nut, Buttercream, and Vanilla cream chocolates sit outside a heart-shaped box at Anderson's Candy Shop Tuesday, Feb. 10, 2015 in Richmond. Preparation for the holiday began just before Christmas, preparing boxes of chocolates ranging from 2-ounces to 6-pounds. The fourth-generation candy shop which opened in 1919 in Chicago and then moved to Richmond in 1926, offers at least 80 different varieties of chocolates and will have special hours for the week of Valentines Day. 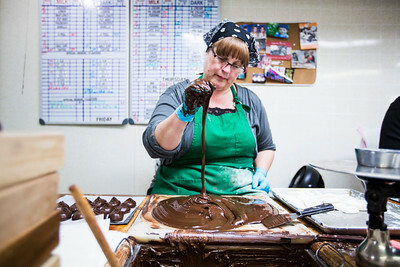 Kyle Grillot - kgrillot@shawmedia.com In preparation for Valentines Day, Colleen Vineyard of Johnsburg hand dip chocolates at Anderson's Candy Shop Tuesday, Feb. 10, 2015 in Richmond. Preparation for the holiday began just before Christmas, preparing boxes of chocolates ranging from 2-ounces to 6-pounds. The fourth-generation candy shop which opened in 1919 in Chicago and then moved to Richmond in 1926, offers at least 80 different varieties of chocolates and will have special hours for the week of Valentines Day. 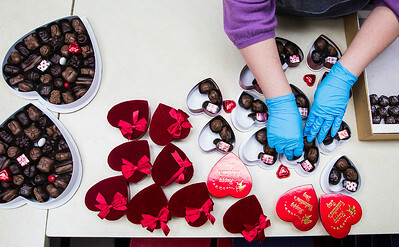 Kyle Grillot - kgrillot@shawmedia.com In preparation for Valentines Day orders, Britta Malsch of Genoa City, Wis., packages chocolates into heart-shaped boxes at Anderson's Candy Shop Tuesday, Feb. 10, 2015 in Richmond. Preparation for the holiday began just before Christmas, preparing boxes of chocolates ranging from 2-ounces to 6-pounds. The fourth-generation candy shop which opened in 1919 in Chicago and then moved to Richmond in 1926, offers at least 80 different varieties of chocolates and will have special hours for the week of Valentines Day. Kyle Grillot - kgrillot@shawmedia.com In preparation for Valentines Day, a limited edition raspberry truffle rests inside Anderson's Candy Shop Tuesday, Feb. 10, 2015 in Richmond. Preparation for the holiday began just before Christmas, preparing boxes of chocolates ranging from 2-ounces to 6-pounds. The fourth-generation candy shop which opened in 1919 in Chicago and then moved to Richmond in 1926, offers at least 80 different varieties of chocolates and will have special hours for the week of Valentines Day. 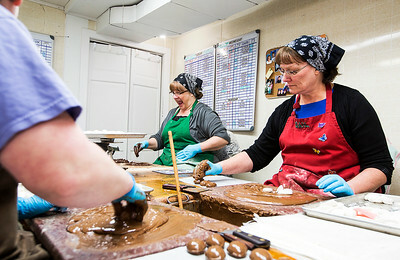 Kyle Grillot - kgrillot@shawmedia.com Workers Tracy Anderson, (from left), Melanie Zerr, owner Leif Anderson, and Katie Anderson prepare orders and create chocolates inside Anderson's Candy Shop Tuesday, Feb. 10, 2015 in Richmond. 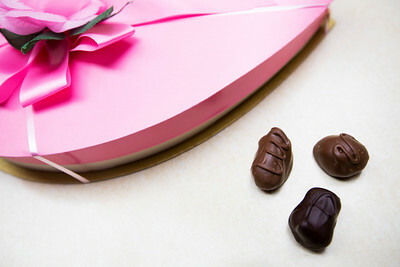 Preparation for the Valentines Day holiday began just before Christmas, preparing boxes of chocolates ranging from 2-ounces to 6-pounds. The fourth-generation candy shop which opened in 1919 in Chicago and then moved to Richmond in 1926, offers at least 80 different varieties of chocolates and will have special hours for the week of Valentines Day. 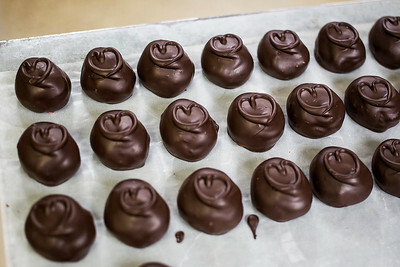 A Maple nut, Buttercream, and Vanilla cream chocolates sit outside a heart-shaped box at Anderson's Candy Shop Tuesday, Feb. 10, 2015 in Richmond. 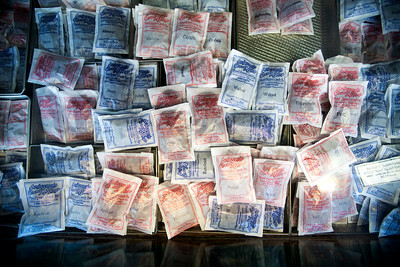 Preparation for the holiday began just before Christmas, preparing boxes of chocolates ranging from 2-ounces to 6-pounds. The fourth-generation candy shop which opened in 1919 in Chicago and then moved to Richmond in 1926, offers at least 80 different varieties of chocolates and will have special hours for the week of Valentines Day.